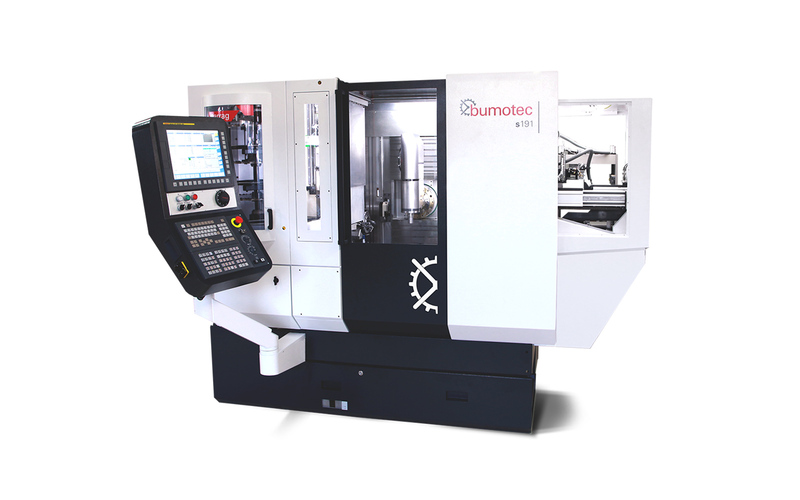 The Bumotec s191V is the combination of proven Swiss made mechanics and state-of-the-art CNC control and drive technology. 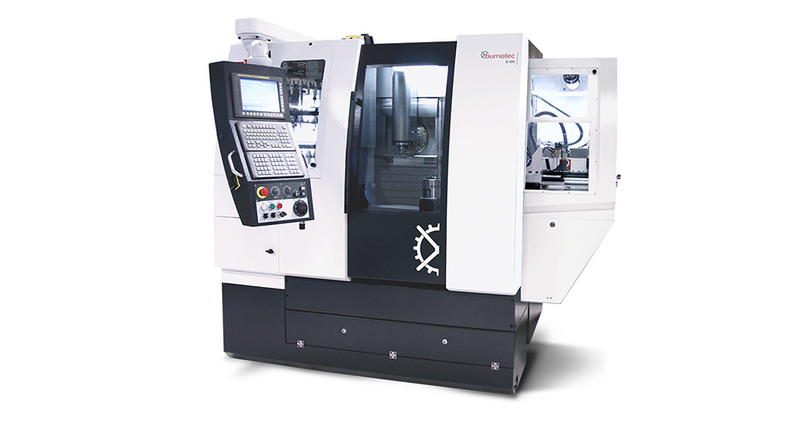 With the CNC Bumotec s191V mill / turn center, precise and complex components can be produced via 5-axis machining. Thanks to its stable mechanical concept and its linear drive technology, accuracies of just a few microns can be achieved. 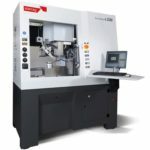 The integration of an individually adaptable automatic workpiece change unit, allows the machine to be used for one off prototypes or to run so called «unmanned shifts» without personnel. Many different configurations are available with three to five axes of machining capacity. The thermal stabilization unit almost eliminates warm-up cycles when starting or after machining interruptions. 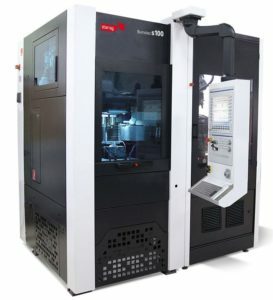 Compact and highly efficient machining solution, s191V model geometric adjustments finishing is performed by SIP specialists using highly skilled scraping process. 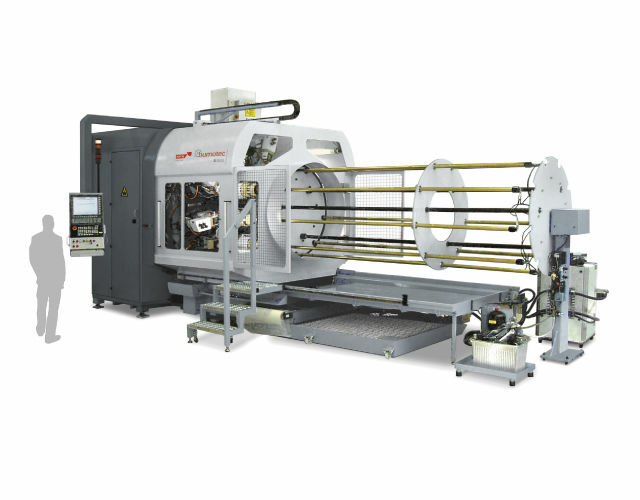 The s191V SIP Engineered integrating this process, ensures a machine that is free of all mechanical tension and a stable structure. 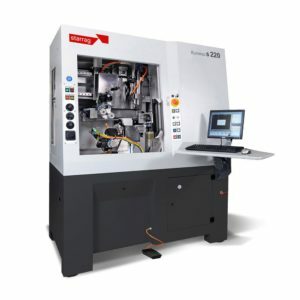 The 5-axis Mill / Turn center model s128 is a perfect combination of maximum performance and minimum footprint. On less than 2m², the s128 is a concentrate of high technology; Milling, Turning, Drilling, Engraving, Setting preparation and Diamond cutting processes are possible to produce parts as single unit or as serial manufacturing. The machining of miscellaneous parts from bar or blank and demanding perfect surface quality can be achieved with very short changeover time. With more than 10 years of experience acquired on our s191 model, the benchmark on the market, Bumotec launches the new series of s181, which combines the best of Swiss made know-how and a high degree of innovation. With twin machining stations , a milling spindle capable to reach up to 40’000 rpm’s and a high availability of tooling in the automatic tool magazine, Bumotec s181 has the capability to produce complex components from bar stock up to 32 mm diameter. The machine mineral casting bed, the latest CNC technology and the linear motor drives ensure uncompromised thermic stability and performances. Suitable for Watch, surgical instruments, medical implants and complex micro-mechanical components, the s181 is a major asset to help you to take on the actual and future industry challenges. Innovative concept ensures an important productivity gain, thanks to the possibility to simultaneous machining on two working stations. Up to +40% increased productivity! 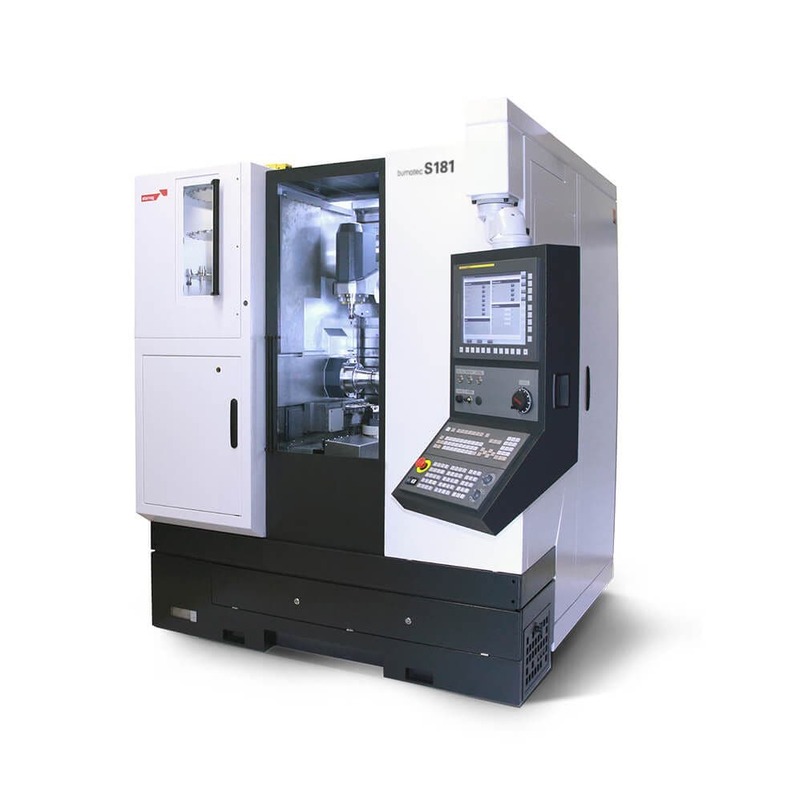 The machines of the S191 series are suitable for turning, milling and grinding of individual parts or from bar (diameters: 32, 50 and 65 mm) in a single setting. The series has an extremely versatile modular structure, which means that it is possible to build any kind of machines from standardised modules for various machining tasks – including a machining center with seven axes and three spindles. 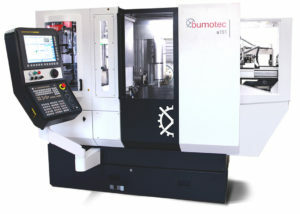 The CNC Bumotec S191 Linear turnmill center is suitable for complete machining of very complex six sided parts. Linear motors ensure maximum precision and reliable repeatability in the machining of parts. Thanks to the combination of the rapid linear drive (acceleration: 1.1 g; speed: 50 m/min) with a high-resolution Renishaw measurement system (resolution: 1/100 µm) and a stabilised cooling circuit for all heat-generating elements, the S191 Linear achieves excellent productivity. 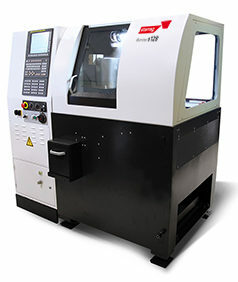 A unique feature is the high-speed spindle (150,000 rpm), on which it is possible not only to turn and mill ceramic parts but, using different grinding discs (measuring 0.5 to 80 mm), they can also be dry-ground. 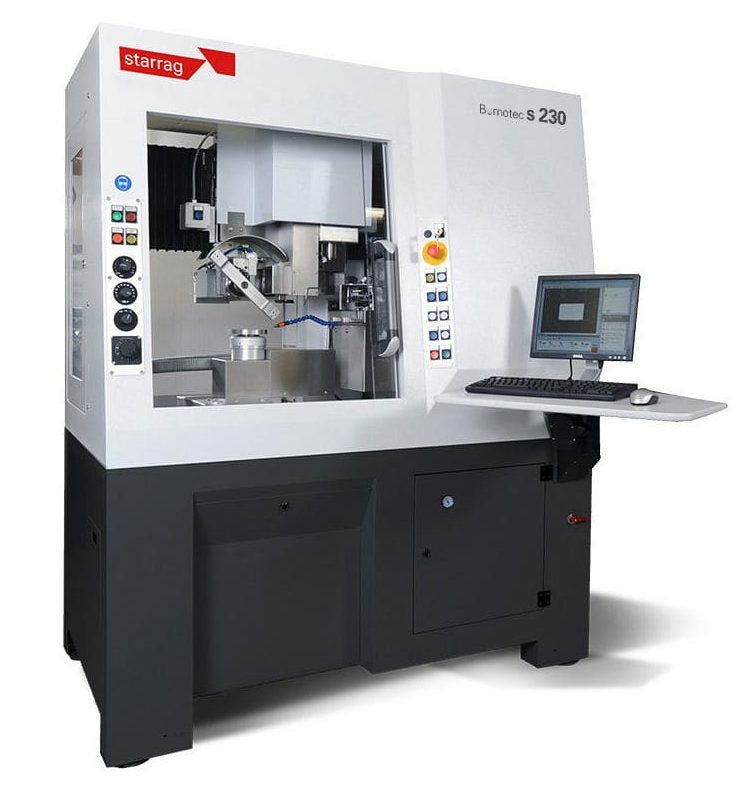 s230 is an automatic solution for faceting and diamond finishing dials index. s230 production center allows the production of a wide variety on index in various metals. Contrasts of different visual effects are performed by the use of diamond tools or solid carbide tools. The complete solution for small and medium series for finishing index combines multiple operations on a single machine. Finishing centers for the jewelry industries, the machines range s210/ s220 combine several processes such as Milling, Engraving, Drilling and Faceting to produce parts for the most demanding key players of the jewelry crafts worldwide. His legendary finishing qualities best fit the requirements in terms of accuracy and ease of use. A standalone mono-station machine. A compact industrial concept for maximum performance taking up minimum floor space. 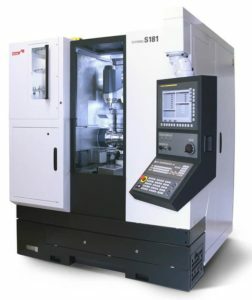 With its dual spindle concept enabling concurrent tool change operations, its high dynamic acceleration, its powered spindles capable of a rotation speed of up to 60.000 min-1, its high number of tools, the s100 is a modern production tool pushing back the boundaries of high-precision machining. The s100 range makes it possible to produce highly complex parts. Ideal for 3 axis machining of watch movement parts, it has also proven itself unbeatable in a whole host of fields, such as mobile telephony, electronics or nanotechnologies. 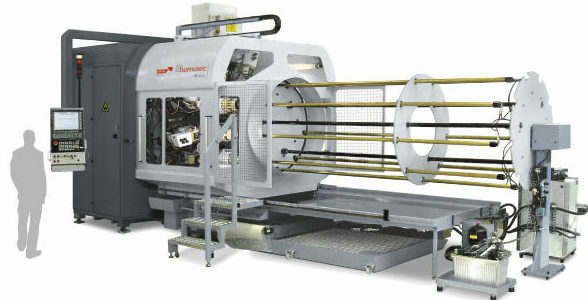 The Bumotec S1000 C horizontal transfer machine was designed to manufacture prismatic parts from round or profiled bar stock. Small and complex components can be efficiently machined in medium to large batch sizes. 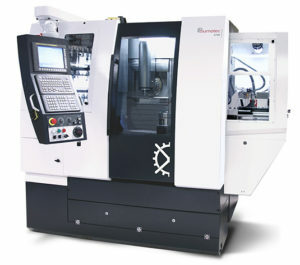 The machine is configured with seven 4-axis machining stations, each equipped with 4 machining spindles (2 horizontal and 2 vertical). The eight station comprises a 4-axis cut off station with a single spindle. An optional ninth station allows the component to be reclamped to allow the sixth side of the component to be machined with an additional 3-axis, 3 spindle machining unit. The machine is equipped with an automatic bar feed and quick change tool clamping system for optimum production rates. 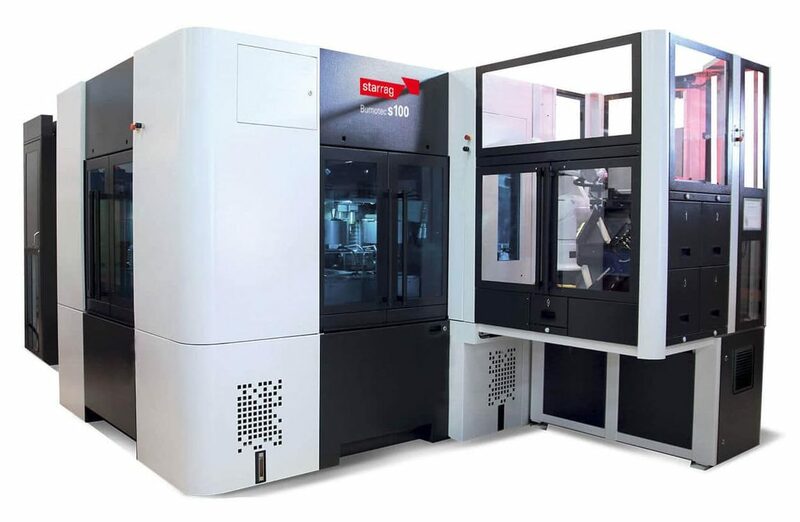 Thanks to linear motors in all axes, the recently developed machine concept of the Bumotec s100 multi machining center accelerates and cuts extremely fast (minimum chip-to-chip time: 500 ms) These enormous performances are also due to a high-speed spindle (60,000 rpm). Four workstations, equipped with a large tool capacity, and two milling spindles work simultaneously. Thanks to its low footprint and multiple tool magazines (up to 144 tools), the dynamic transfer center is ideal for manufacturers producing ultra-precise components for clocks, computers and electronic applications made from brass, aluminium or stainless steel – very fast and in batch sizes from one to bulk production runs. This makes the machine ideally suited for components up to a size of 80 x 80 x 80 mm.